The next-generation Rolls-Royce Phantom is due to join us in 2018, meaning the current model is soon to bow out. What does the future car have to live up to? In the north-east corner of a small graveyard next to a remote 13th century church, found down an overgrown path in the heart of rural Monmouthshire, lies the grave of Charles Stewart Rolls. In all, he spent just fewer than 33 years on this earth, an age at which most of us would be happy still to think we were embarking on life’s great adventure. Yet in that time Rolls became an avid balloonist and a racing driver and aviator of international renown. He broke the land speed record (albeit unofficially) and toyed with powered flight long before the Wright Brothers took to the skies, and while many remember that it was Louis Blériot who first flew across the English Channel in 1909, few recall that it was Rolls who was first to make the far more hazardous flight in both directions the following year. Tragically, he was also the first Briton to be killed in an aircraft accident, and indeed the first man to so die on British soil when his Wright Flyer broke up during a display near Bournemouth on 12 July 1910. Yet today all of this is forgotten, or at least so buried in the shadow of the legacy we do recall as to be all but entirely obscured. In 1906, with Henry Royce, he founded what would come to be regarded as the finest car company the world had ever known. 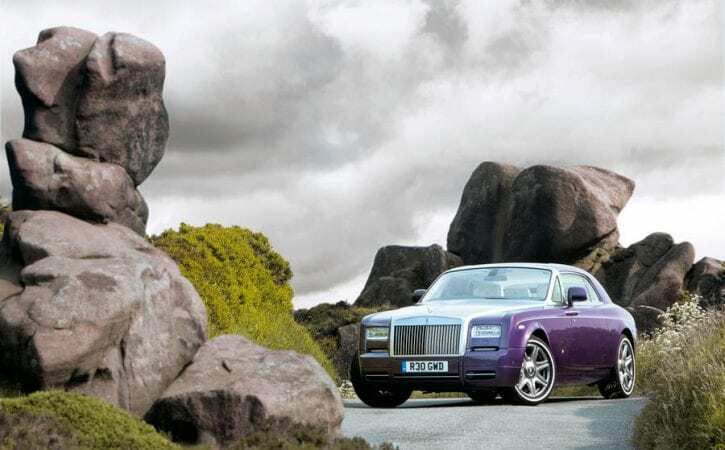 It seems appropriate to be here in a Phantom Coupé, if perhaps not one quite so preposterously purple as this. While it was Rolls and Royce who started the company 110 years ago, it was with the Phantom that it was born again rather more recently than that. In 2003 the Phantom was Rolls-Royce – the only product it had to sell – and Rolls-Royce was a company unrelated to the one that Charles and Henry had set up. It was as it remains today, a wholly owned subsidiary of BMW, which simply acquired the rights to call a car of its own creation a Rolls-Royce from that other R-R, Rolls-Royce PLC, which makes engines for aircraft, warships and submarines. How we worried. And when we learned the car would be engineered largely in Germany, largely by German engineers, and shipped to the UK only for final assembly, wood, paint and trim, we worried some more. By the time the deal that created the new Rolls-Royce was done in 1998, we’d already seen how BMW handled British brands and, as any former Rover employee would tell you, the results weren’t pretty. We were yet to have any inkling of the success it would enjoy with Mini; nor had we seen its stunningly successful take on a 21st century Range Rover. There was good reason to think Rolls-Royce, a brand already heading for moribundity under previous proprietor Vickers, might not survive the transition. Then came the Phantom, a statement of intent as powerful in 2003 as had been the Lamborghini Miura in 1966. Not everyone cared for its styling, but one thing no one doubted: imposing and ostentatious, this was a Rolls-Royce. You sat as high as you might in that Range Rover and looked down upon your subjects and across that vast bonnet to the sculpture of Eleanor Velasco Thornton (better known as the Spirit of Ecstasy) on its prow and your realm beyond. Of course, BMW could not conceal its origins entirely and in some regards, such as the satellite navigation system, appeared not to have bothered to try. It also didn’t attempt to deny that its 6.75-litre V12 was derived from the motor in the flagship 7 Series, although it bridled rather more swiftly when the car was claimed to be based on its big limo architecture. It was not. Then, as now, it uses a bespoke aluminium spaceframe, closer in concept to an Audi A8 than a 7 Series. And then we drove it. I remember it well: Santa Barbara in the summer of 2003. Steve Cropley and I took one to a drive-through burger joint because, well, we could. We both really enjoyed the car, but for a brand famed for automotive perfection it was far from perfect, even then. How would it seem now, more than a dozen years later? Before our journey began, we took time to photograph the Phantom where Charles Rolls grew up, at The Hendre, the family seat of Lord and Lady Llangattock and their predecessors, now the Rolls of Monmouth Golf Club. Charles was their third son but the first to die. His grief-stricken father died little more than two years later, in 1912, Charles’ two brothers in 1916, one from influenza (frequently fatal back then) and the other on the Somme. Their daughter lived a normal life span. If you look at The Hendre now, it is not difficult to imagine the life young master Rolls enjoyed while not away being educated at Eton and Trinity College, Cambridge. It is a house outside which a Phantom sits very comfortably indeed. Rolls himself would have been proud of our plan, such was its ambition. The execution? He may have admired that a little less. We wanted to drive from Monmouth to Derby, where Rolls-Royce first built cars, then to Manchester and the Midland Hotel where Rolls first met Royce in 1904, thence to the Duke of Portland’s drive at Clipstone, Nottinghamshire, to see where he covered a kilometre in 27 seconds in a 1903 Mors, at a world record speed of almost 83mph, only to be disqualified because the course was slightly downhill. Finally, we would end at the former site of Southbourne Aerodrome, where his story ended. If we’d just driven, we’d probably have made it, but such is the imperative of stories such as this one to carry supporting photography that we timed out in the Derbyshire Peak District. Pathetic, I know. But I still managed to cover 400 miles in the Phantom, along motorways and A-roads, through towns and over mountains. Really, I wanted the answer to just two questions. First, could a car that easy to fault when it was new still withstand scrutiny in its last year of life? Second, what elements did it possess, even if more conceptual than physical, that needed to be preserved for the next generation, due in 2018? To answer the first question is easy, because despite it all, the car still stacks up, still feels and behaves like a Rolls. Here, age is an irrelevance, because you could say exactly the same about the first Phantom when it was launched a little over 90 years ago. Today’s car passes the test because it still feels entirely different from anything else out there. The latest S-Class Mercedes probably rides a little better, while a Bentley Mulsanne is assembled with no less exquisite attention to detail. But to sit that high, in such comfort and in a car of that quality remains an exclusively Rolls-Royce preserve. Forget all the huffing and puffing about Cullinan; in size and might, Rolls-Royce has already been building what might as well be an SUV for years. Inside, it is also exquisitely tasteful, but to see that you have to mentally tune out the ice-white leather and celestial headlining options. It may be lost on many, but the choice of typeface on the dials, even the shape of the needles, echoes those of Rolls-Royces from long before the last war. The shape of the elegantly slender indicator stalks, the size and design of that vast, imposing wheel and even the horizontal rotary dials that manage the air conditioning all speak for how closely the new Rolls-Royce studied the heritage of the old. Actually, it doesn’t ride quite as well as I remembered, but then this Phantom Coupé sits on a shorter chassis with stiffer springs than the standard Phantom saloon. It’s still pretty dreamy most of the time, still capable of wafting like no other. Charles Rolls would have liked it, I’m sure, because while subscribing to all the traditional Rolls values of comfort and quality, so, too, does it have a whiff of the spirit of the man who died at Southbourne that day. Rolls was a racing driver, for goodness’ sake, with as much right to be called an RAC Tourist Trophy winner as Allan McNish, Tom Walkinshaw or Stirling Moss. That’s right: Rolls won one of the biggest races of the day and was in a Rolls-Royce when he did it. The Coupé has this raffish quality to its design, a suggestion that it’s a device for playboys and bounders. It even has a Sport button, although I really rather wish it didn’t. But its age is showing. In 2003, a 6.75-litre V12 sounded like the stuff of supercars, but in 2016 the 453bhp it develops is very little more than you’ll find under the bonnet of a BMW M3 with an engine of half the size and cylinder count. A car like this should never be sporting but always be rapid, capable of dismissing anything impertinent enough to come sniffing at its tailpipes, and these days it’s a role it plays with increasingly less conviction. For their low-down torque and refinement, and although the very idea would probably send Sir Henry Royce spinning in his grave, the Phantom would suit turbochargers better than almost any other car on the road. But it still handles as a Rolls-Royce should, except we can’t call it handling. We must call it ‘addressing the road’, for that is how it feels. Good handling is not actually defined by an amount of grip or propensity for going sideways; it is simply a car’s ability accurately to interpret and execute its driver’s instructions. The Phantom does this beautifully. For such a heavy, long and massively constructed car, it can be hustled along quite quickly. Just aim Eleanor at your apex and, while she may list a bit on the way, she’ll get you there. So to the second question: what from this Phantom must be preserved for the next? Very little that is measurable. It should be quicker, but if it’s still slower than a Ghost, no one should care. It should use less fuel, but only to increase its range. What matters is that it remains unlike any other car in the world both in the way it is built and the materials used to build it. It needs to have the best ride quality of any car on sale (which it once did) and the best refinement, which is not easy with a frontal area like that. More than anything, however, it must exist in a class of one. If it can readily and relevantly be compared with any other car, it will have fallen at the first. People must want to buy it not just for what they think it tells others about their bank balance, but also because it genuinely represents something unobtainable anywhere else. Back in 1907, just three years after Charles Rolls met Henry Royce, the original Silver Ghost became known simply as ‘The Best Car in the World’. Then, as now, for a car such as this, nothing less will do.